My father, William Hugh Middleton-Jones, (known as ‘Bill’) was born in Swansea, South Wales, on 5 March 1912 two years prior to the outbreak of WW1. He grew up in the Swansea area and was educated at Dynevor school, Pell street. In his early teens he worked for his father for a time, but was always interested in how things work and possessed a keen artistic flare, making his first crystal radio receiver by the age of 14. Later he trained as a railway engineer, eventually being employed in the railway yard at Paxton street Swansea. In the 1930’s my father was a scout master at the Swansea Parish Church of St Mary’s and his talents in carpentry and engineering were put to good use on the many scouting camping expeditions. Prior to the outbreak of WW2 in 1939, the capacity of the Territorial Army (reservists) doubled, and as an engineer my father was one of the first to join the reservists. Engineers and especially rail engineers were considered highly useful by the military and many personnel in this field were put on the T.A. list. At the outbreak of WW2, their tasks in local areas were of high importance and vital to the supplies and defence of Britain, especially areas like Swansea which was an important sea port. Whilst still a reservist, in the October of 1940 my father was transferred as a T.A. engineer to Longmoor camp in Hampshire, where his rank and trade was 2129077 Sapper WHM Jones No 1 RTC RE. His certificate of trade proficiency was undertaken at Longmoor on 20 November 1940, and completed his test for checker (railway) Group D on 17 October 1940, and signed off by Captain RE OC ‘B’coy No 8 railway. Longmoor military railway was built by the Royal Engineers in 1903 in order to train soldiers on railway construction operations. The main street of Longmoor camp was actually built on an ancient Roman road, the Chichester to Silchester way. The camps were named after successful battles and locations from the Boer war in order to give the troops a homecoming spirit. The military railway was renamed the Longmoor railway in 1935, and was notable in more modern times for the filming locations of the Great St. Trinians Train Robbery (1966). The camp was closed in 1969. His army records state that my father was at home from 17 October 1940 to 27 June 1941 (284 days) and overseas 28 July 1941 to 19 August 1945 (4 years 23 days). Once in North Africa he was assigned to the Royal Engineers Docks Operational Company (Dock coy Co) 1017. He was assigned to duty in Egypt, Palestine and Italy and on 19 July 1942 was admitted for 2 weeks to the 3 New Zealand hospital Beirut, being discharged on 3 August. This coincided with the first Battle of El-Alamein 1 July to 27 July 1942. My father was released to class Z list in January 1946, with a class A release on 2 May 1946. 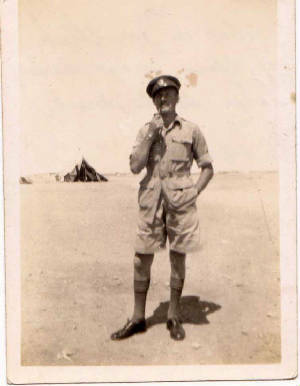 My father was involved in various expeditions and operations during his time in North Africa and the Mediterranean area, many of which will be posted on this site. Due to the nature of many companies merging with other groups, and nationalities, especially American and Indian army, it is difficult to track down some of the information. Much of what I have gleamed is from the war diaries of the RE dock operations 1017 company, housed at the national archives Kew. In order to track any additional information, the war diaries of other companies will have to be researched in the Kew archives.